Abuja – The Independent National Electoral Commission (INEC) said its partnership with Civil Society Organisations (CSOs) and the media has helped in strengthening the electoral process and consolidating Nigeria’s democracy. INEC National Chairman, Mahamood Yakubu addressing pressmen on new release of 2019 Election Time Table and Schedule of Activities for 2019 Federal Capital Territory (FCT) Area Council Elections while at INEC Office Abuja. Photo by Gbemiga Olamikan. The Chairman of INEC, Prof. Mahmood Yakubu said this at the Commission’s separate Quarterly Consultative meetings with CSOs and the media on Monday in Abuja. Yakubu described CSOs and Media as critical electoral partners of the Commission. He said that the CSOs partnership with INEC had been of extreme assistance in strengthening the electoral process and consolidating Nigeria’s democracy. “The feedback we receive from you on elections, improvement of the electoral frameworks, mobilisation and sensitisation of citizens, as well as your reports on particular elections and other issues have been of good value. “These have been of extreme value in shaping policies, redefining the works of the Commission, including conducting air elections in line with the constitution and Electoral Act. Also at the meeting with the media, Yakubu said that its partnership with the Commission had also helped in chatting the way forward for the electoral process. “We believe that the media has important role to play in shaping policies and chatting a way forward for our elections. “We believe that it is only when we work in partnership we can take our elections to the next line,’’ Yakubu said. Mr Waheed Odusile, the President of the Nigeria Union of Journalists (NUJ), assured that the media in line with its determination to deepen the country’s democracy would continue to give INEC the necessary support. Odusile, represented by Mr Adebayo Bodunrin of DAAR Communications, advised INEC not to be discouraged on its efforts to deliver credible, free and fair elections. 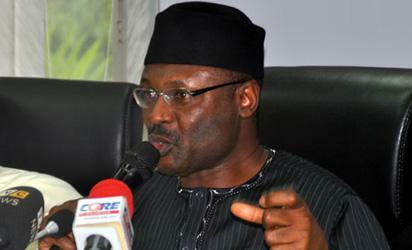 “INEC should be conscious of the comments of Nigerians and not be discouraged by complaints. “The Commission should try as much as possible to key to its pledge of ensuring free and fair election. Mrs Faith Uwadishi of the Independent Service Delivery Monitoring Group, who spoke on behalf of CSOs, assured that the organisations would continue to work with INEC to deepen the electoral process. Uwadishi said that the organisations would also work with the Commission to continue to ensure free and fair elections in the country. Issues discussed at both meetings include INEC level of preparedness for the 2019 general elections and update on the ongoing Continue Voter Registration. The post INEC’s partnership with CSOs, media has strengthened electoral system – Yakubu appeared first on Vanguard News.